Hasbro really wants me to write about the Amazon Dash button that’s now available for Nerf. They’ve sent me press releases, images, a blaster missing most of its darts, a hand-written note encouraging my use, an actual Dash button, and even an Amazon gift card to help me try it out. In other words, they’re doing all they can to get me excited about it, but much like the rest of the Nerf fan community with whom I interact, my initial to reaction to the Amazon Dash button for Nerf was a resounding “meh.” Nonetheless, I decided to give it a try. 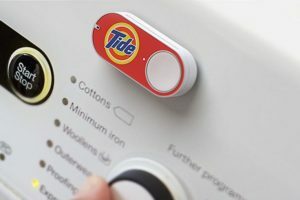 The concept of the Amazon Dash button feels like something out of a product planner’s dream… eliminate all the barriers to purchase by creating a product-specific “easy button.” At the same time, by making that button exclusive to your particular brand, the dangers of cross-shopping can be virtually eliminated. Oh, and since you don’t have to leave the comfort of your own home to make said purchase, there’s no reason not to buy that item immediately–and repeatedly. It’s like eBay’s “Buy it Now” button for the instant-gratification generation. It’s modern consumption at its best (and possibly, worst). So, what is the Amazon Dash button, exactly? The Dash is a physical device that is sold by Amazon for $4.99 (with a $4.99 credit toward your first purchase) that allows consumers to instantly order products through their connected Amazon Prime accounts via WiFi. When a Dash button is pressed, it sends a signal via WiFi to the users connected device (a smartphone running the Amazon app), which places an order without any further interaction from the user. The device is small, and has only a single button. It can be placed virtually anywhere around the house, and was originally intended for high-consumption items like paper towels, detergent, etc. A single press places an order, though the user has half an hour to cancel the order via a notification sent to their mobile device. Repeat orders won’t be sent until the initial order has shipped, preventing unintended multiple orders. PAWTUCKET, R.I.–(BUSINESS WIRE)–Families can now stay stocked up on their favorite playtime essentials with the introduction of Amazon Dash Buttons for the Hasbro, Inc. (NASDAQ: HAS) PLAY-DOH and NERF brands. Launching today, PLAY-DOH and NERF are the first toy brands available in Amazon’s popular program which allows Amazon Prime customers to reorder preferred products with the press of a button. The Amazon Dash Button is a small, Wi-Fi connected electronic device that makes ordering products quick and efficient. Starting today, the Amazon Dash Buttons for the PLAY-DOH and NERF brands are available for Amazon Prime customers to order onwww.amazon.com/dashbutton. Once purchased, Amazon Prime members sync the buttons to their Amazon Prime accounts for fast, convenient ordering with Prime FREE Shipping. By pressing the Amazon Dash Button for the PLAY-DOH brand, customers can order a PLAY-DOH Mega Pack, PLAY-DOH 24-Pack of Colors, or a PLAY-DOH Fun Tub. 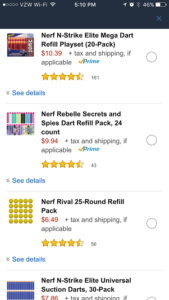 With the Amazon Dash Button for the NERF brand, customers can order dart refills for the NERF N-STRIKE ELITE, NERF REBELLE, and NERF RIVAL blasters and bows. So, Amazon Dash buttons are for our benefit, get it? They’re just trying to make our lives easier by eliminating the hassle (?) of purchasing darts via traditional means. Fair enough. But is that actually true? 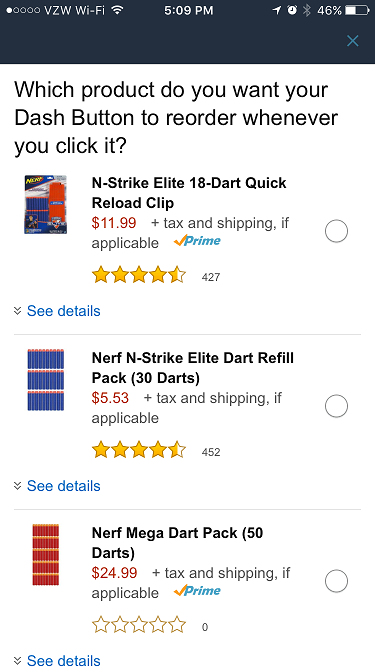 Does the Amazon Dash button for Nerf make it easier, more enjoyable, or somehow more cost-effective than buying darts in other ways? Well, I had to test it to find out. The first thing I noted in attempting to set-up my Nerf Dash button is that it requires a smartphone running the Amazon app. So if you’re looking to set-up a Dash button at home with just a computer, you’re SOL. But the Dash is really more for early-adopters at this stage, so let’s assume having a reasonably modern smartphone with the Amazon app isn’t an issue. The next small hurdle you’ll encounter is the need to re-enter your Amazon app password to initiate the set-up, even if you’re already logged-in to the app. The Touch ID feature rarely works on my phone, so I had to open my password management app to find out what password I have set-up for Amazon, and then copy it over accordingly. Assuming you’ve met the smartphone criteria for Dash set-up, you’re about halfway there. During Dash set-up, even though you’re using your phone, you also have to connect the Dash via WiFi–and doing so requires the password of whatever WiFi network it’s using. So if you’re anywhere other than on your own network when you first try to set-up the Dash, you may hit a dead-end (that’s what happened to me, initially). Since I wasn’t in range of my home’s WiFi when I first tried to set-up the Dash, and didn’t know the password of the network where I was located, I wasn’t unable to get things rolling right away. So much for convenience. The first pause came when Amazon wanted to know if it could access the password on my personal network for other, poorly defined purposes (um.. how about no?). Next, the Dash can be used to auto-magically order any of several pre-determined Nerf items, but they (Hasbro?) pick which ones. So, if you like the ones they’ve picked, then great. If you don’t, sorry. 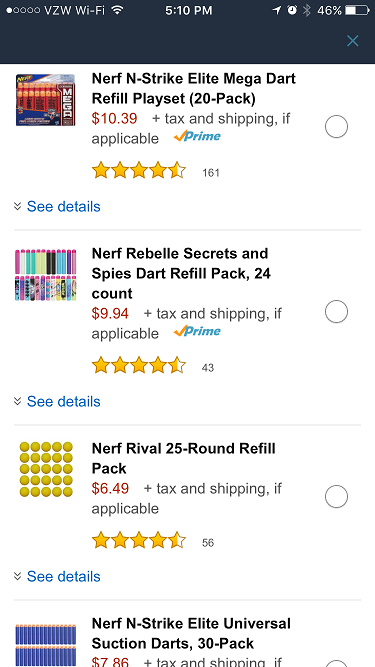 And on the Amazon Dash for Nerf page, they don’t directly tell you which items can be re-ordered using the Dash. You have to instead click on a button that goes to another page, to see what’s available. Best I can tell, the items are all sold by and shipped from Amazon. However, if you’re viewing your buying options from your mobile device, it’s not totally clear since not every item has a “Prime” logo next to it (some do, some don’t). So I just stuck with a product that was clearly labeled “Prime,” to be safe. But they should really make this more easily understood. It’s possible to re-associate your Dash button to a different product within the sphere of pre-chosen items (if, for instance, you stock-up on MEGAs and want to get some Elites). But doing so is a 5-step process via settings on your phone. Lastly, Amazon asked me to “Turn on Notifications” to be made aware of when Dash orders are placed. That makes sense, except that it didn’t indicate in the set-up if the notifications were limited to Dash, or if it was for all Amazon purchases. I order a lot of other stuff from Amazon, and I don’t want notifications every time I place a random order, or part of an order ships, or my package is delivered, etc. I just want notifications for Dash orders to know they’ve been placed, and that’s it. Fortunately, it does appear this is possible, but figuring that out required turning on notifications and a trip to the same Dash sub-menu on my mobile device. Once set-up, the Amazon Dash button for Nerf was actually quite easy to use. When the Dash button is pressed, there are some blinky lights to tell you it’s doing stuff, and that’s it. Then, a couple days later, your product arrives per the Amazon Prime standard. In my case, it was a pack of “Nerf N-Strike Elite Universal Suction Darts, 30-Pack” that was selling for $7.86 with free shipping from Prime–I could have gotten regular Elites, RIVAL HIRs, Rebelle darts, MEGA darts and a few other, related items, but I have lots of all of those, so I went with the suction-tipped ones since I don’t have many of those on-hand. And sure enough, they arrived at my house just like every other Prime product, and all was well. But simply pressing a Dash button to place an order feels TOO easy. It’s almost Pavlovian, really… like the American consumer has been reduced to a hamster pressing a button for a treat in the eyes of corporations. Economists have long said that people who use credit cards spend more than those who use cash, since spending cash requires them to physically SEE the money leaving their hands. And this feels even worse. Pressing a Dash button is so far removed from the feeling of spending money, it really doesn’t seem like you’re spending money at all. That’s probably exactly what a company like Hasbro has in mind, but for consumers who aren’t particularly well-disciplined (which is, oh, most of America, particularly kids), that could be problematic. Yet, the Dash button for Nerf has a bigger problem: it’s rather pointless. It’s true that Nerf enthusiasts do lose darts. 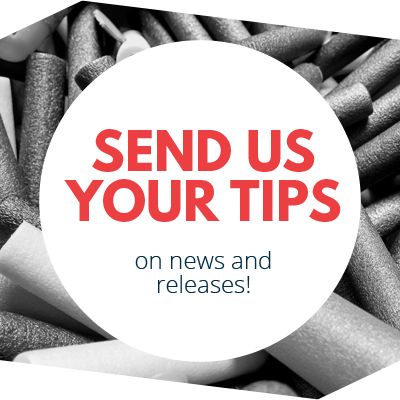 But many fans don’t use Nerf darts at all–Elites are known for poor accuracy and other issues, so many fans use third-party darts with superior qualities of flight, durability, economy, or all of the above. In other words, those who go through darts the fastest are also the ones who are the least likely to want to purchase darts made by Hasbro in the first place. So who is the button for? Perhaps moms and dads with kids who frequently engage in Nerf battles, and who don’t particularly care how many darts are consumed will find the Dash button for Nerf to be of value. But I have my doubts. At least trying it out won’t cost you anything beyond the price of the item (Amazon pays for the Dash with your first purchase). 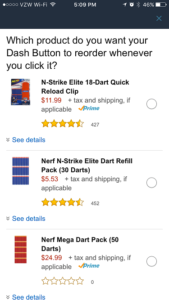 So if you like Nerf darts, you go through them frequently, you don’t mind waiting a minimum of two days to receive them, you’re ok with the limited purchase choices, you want to order the same thing every time (or don’t mind taking the time to re-associate your Dash with a new product), you’ve got an Amazon Prime account, you have a smartphone running the Amazon app, you have a WiFi network, you only place orders within that network, and you’re not a compulsive buyer with a spending problem, the Dash button just might make sense. For everyone else–which is likely almost everyone who actually uses Nerf blasters to play–the Amazon Dash for Nerf is an overly-limiting solution to a problem that no one has asked to be solved. Sure, Nerf darts are a “consumable,” but until Amazon can drop them to you in the heat of battle via drone flying overhead, the Dash button doesn’t do anything for the average Nerf player that would be of particular value. If anything, the Dash button for Nerf is overly limiting with no real up-side for the user other than… saving maybe 2 or 3 taps in the regular app? 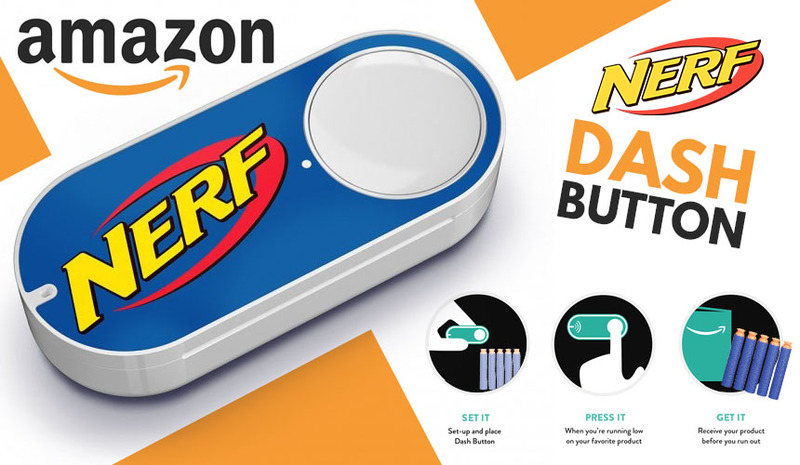 The intent seems good, but a Dash button for detergent when your laundry can wait a day or two and you always get the same kind makes a lot more sense than a Dash button for Nerf when you need darts right now, and potentially for a variety of different blaster types. There are a lot of products for which the Amazon Dash button makes reasonable sense. But Nerf is not one of them. This entry was posted in Parts/Ammo, Reviews and tagged Amazon, Amazon Dash, Amazon Dash for Nerf, Dash on July 19, 2016 by PMindemann. 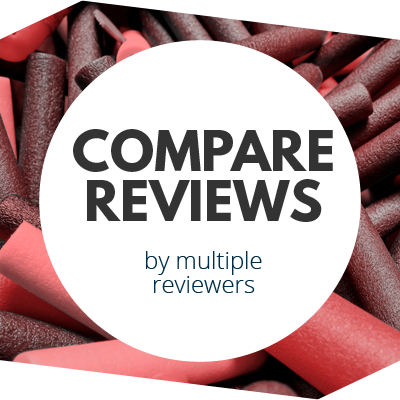 Review: Buzz Bee Destiny (18m/60ft EU) Nerf Rival Khaos Review: Frustrating and Fun? So, my newest nightmare is having the dash in my pocket and pocket-buying random things. Right! But at least it won’t let you buy more than one item before the first one arrives. So, it does have some fail-safes. My question now is how to dispose of the thing… I don’t want to just throw it out, since it probably has a battery with mercury in it, and I have no idea how it might be locally storing personal info (I’m not as concerned about anyone using it to order something, since it still has to be tied to my personal wi-fi).